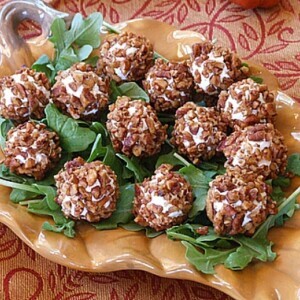 Goat Cheese Truffles with Maple Spiced Pecans are a special, unique appetizer. They’re basically just little rolled balls of goat cheese sprinkled with salt and pepper, and then they’re rolled in the most amazing sweet pecans. 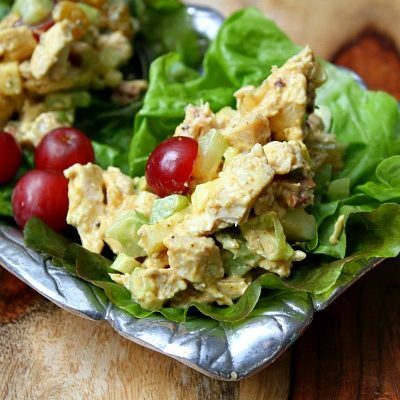 Leftover pecans are terrific in salads too. 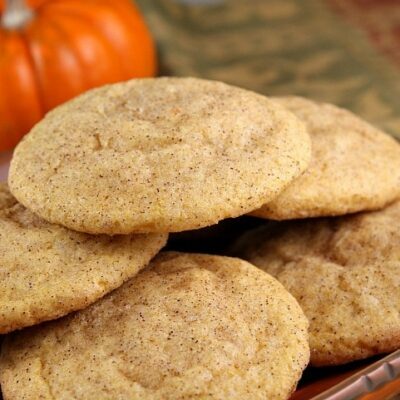 The recipe makes enough pecans to have extra, which are great for tossing into salads. 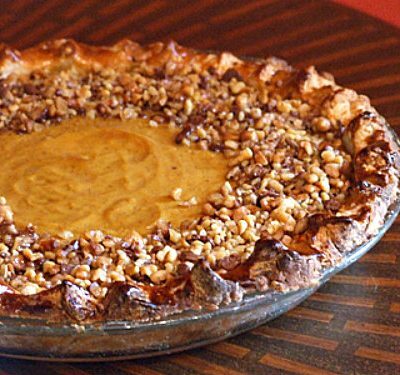 Prepare the pecans: Preheat the oven to 300°F. Line a baking sheet with foil or a Silpat. Combine the butter, syrup, ginger, water, ground ginger, salt, and tabasco in a small saucepan and simmer over low heat for 2-3 minutes. Place the nuts in a bowl, pour the glaze over them and toss well to coat. 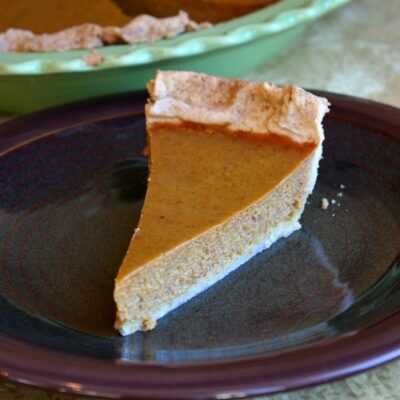 Spread the nuts in a single layer on the prepared baking sheet and bake 30 to 40 minutes, stirring at 15 minute intervals, until nuts are light and almost dry when you toss them. Slide the foil or Silpat off the baking sheet and onto a rack to cool the nuts completely. Assemble truffles: Place goat cheese in a bowl and stir in a generous pinch each of salt and pepper. Roll the cheese into 24 small balls. Roll the balls in the finely chopped nuts. Place the arugula on a platter and top with the coated truffles. Don't chop the pecans too tiny- they'll burn if they're teeny tiny. The nuts may be made ahead and stored in airtight containers at room temperature or in the freezer for up to one month. Extra nuts are terrific in salads. Goat cheese truffles can be made up to 6 hours in advance and refrigerated. Place on arugula-lined platter just before serving. 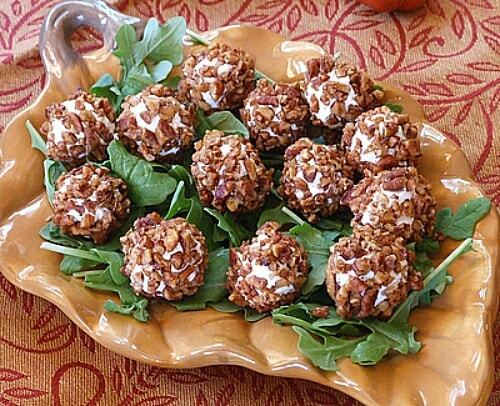 Reader tip: You could even make this one big 'cheese ball' by taking the pound of goat cheese and mixing in a few of the nuts, rolling it into a large ball and rolling it in nuts- served with crackers. I made these for New Year’s Eve and they were a big hit! I would like to suggest adjusting the time on the toasting of the nuts however. I stirred them up at 15 minutes and they were fine, but then didn’t check on them again until the 2nd 15 min, at which point they were burnt and I had to toss them and start over. Big bummer, and I should have known better, since it’s not the 1st time I’ve burned nuts.